Congratulations, Boss, on your election to the National Academy of Sciences!!! On our last day as HHMI employees, we thank the Howard Hughes Medical Institute and the staff of the HHMI Caltech Office of Administrative Services -- Chris Schuld, Angel Rooker, Stefany Nielsen, and Michael Werner (wherever he may be) -- for their support and assistance over the years. We had a great time! Rati Verma, Rob Oania, Heenam Park, Daphne Shimoda on August 4, 2017. Congratulations and best wishes to the Boss on his new position as Senior VP of Discovery Research at Amgen! Congratulations to Liang Xue on his new position at Principal Scientist for Discovery Research at Pfizer! Farewell and best wishes to Min-Kyung Sung. Do well in your new job as a Senior Manager at LG! Congratulations to Craig Crews and the teams at Proteolix, Onyx, and Amgen who contributed to the development of Kyprolis. In news released on 28 February, Amgen announced that Kyprolis conferred an additional 7.6 months of survival compared to Velcade, when both agents are administered to relapsed or refractory multiple myeloma patients along with dexamethasone. This is terrific news for patients. Congratulations to Xing Liu on getting an offer for an Assistant Professorship at Purdue University! Congratulations to Thang Nguyen on acceptance of his paper in PNAS! A belated welcome to our new rotation student, Angel Galvez Merchan! Congratulations to Jing Li on acceptance of his paper at Nature Chemical Biology! Welcome to David Sherman, our new postdoc! Congratulations to Min-Kyung Sung for acceptance of his Tom 1 paper at eLife! Congratulations to Min-Kyung Sung and co-author Justin Reitsma on publication of their paper in Molecular Biology of the Cell! Congratulations to Liang Xue and co-authors Emily Blythe, Jennifer Mamrosh, and Justin Reitsma on publication of their paper in Molecular and Cellular Proteomics! Good luck to Oscar Padilla as he returns to medical training. Congratulations to Jennifer Mamrosh on being selected as a recipient of a Life Sciences Research Foundation postdoctoral fellowship. Welcome to Amgen SURF scholar Courtney Sparger and our new part-time summer lab helper, Ethan Deshaies. Congratulations to Ruzbeh Mosadeghi for his eLife paper, with important contributions from Kurt Reichermeier, Yaru Zhang and Justin Reitsma. Congratulations to Thang Van Nguyen for his Molecular Cell paper, complete with a Preview and an "Editor's Choice" in Science Signaling! Welcome to Caltech student Anusha Nathan and rotation student Yitong Ma. Welcome to our new postdocs Yaru Zhang and Jennifer Mamrosh. Welcome to new rotation student Andrew Patterson. Welcome to Oscar Padilla, our new HHMI Medical Fellow. 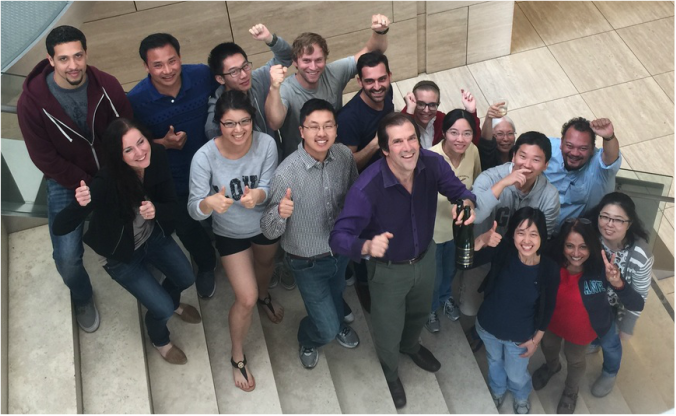 Welcome back to Kurt Reichermeier, our former visiting scholar who has now joined the lab. Congratulations and farewell to Ruzbeh Mosadeghi, who graduated with his Ph.D. and is returning to USC to complete the requirements for his M.D. Welcome to new rotation students Xiawei Huang, Stephanie Threatt and Kurt Reichermeier. Welcome to lab visitor Ronny Straube. Welcome to lab visitor Radoslav Enchev. Congratulations to the former PROTEOLIX team for the recently reported success of carfilzomib in demonstrating superiority over bortezomib in the ENDEAVOR trial. Congratulations, Liang Xue, on your new position as Scientist at Celgene! Congratulations, Willem den Besten, on the start of your new position at Genentech. Good luck! We'll miss you! Congratulations to Willem den Besten on accepting a Senior Research Associate position at Genentech! A belated welcome to undergraduate Namita Ravi and rotation student Junyue Cao, who have been hard at work in the lab through the Fall. Congratulations, Senthil, on assuming your new position as "The Boss" at Virginia Commonwealth! Welcome to summer SURF students SangAh Lee from GIST and Minsoo Kim from Caltech! We welcome graduate student Emily Blythe as the newest member of the Deshaies Lab! Congratulations to Senthil on accepting an offer of a tenure-track Assistant Professorship at Virginia Commonwealth University! Congratulations to Justin on being awarded a Leukemia and Lymphoma Society Fellow Award! Congratulations to lab alumnus Anjanabha Saha on his new position at Nurix! Congratulations to Narimon Honarpour on the publication of his paper in Molecular and Cellular Proteomics! Congratulations to Senthil on the publication of his paper in eLife! Congratulations to Senthil on the selection of his paper by Faculty of 1000! Congratulations to Senthil on the acceptance of his paper by eLife! Congratulations to Natalie Kolawa on the publication of her paper in Molecular and Cellular Proteomics! Congratulations to lab alumnus Dane Mohl on his new position at Amgen!